Dune Landscape by Moonlight was completed during Brouwer's return to Flanders. At this point in his career he started to show appreciation for nature and life around him and it's thought that this scene was taken in the Flemish countryside around Antwerp. The human figures depicted are blurred and in deep shadows and they add life to this sleepy, humbling scene. To the forefront of the image is an old barn or cottage that faces the North Sea and to the left we see the spire of a church most likely part of a small town. Adriaen Brouwer's other landscapes usually contained a form of narrative of peasant life. The artist tried to use the landscape to render the natural aspects of human life amidst nature and his figures always helped to add emotion to his works. 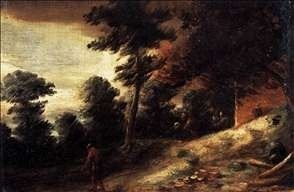 Brouwer's landscapes were inspired by Peter Paul Rubens' works on the same them. Like Rubens, Brouwer uses a hazy atmosphere to render the viewers' psychology and emotions and to truly capture this scene at night. The core focus of Dune Landscape by Moonlight is, undoubtedly, the waxing moon but the scene is a harmonious one as Brouwer blends all of the objects and colors. The shadows of the moon reflect on the sea and lead the eye to the foliage, then to the cottage, on to the three figures and eventually to the steeple and figures on the river bank. Brouwer creates depth by highlighting the rising middle ground and then making it darker as it leads to the water. 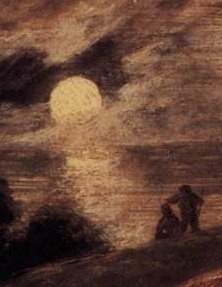 The two figures standing on the embankment are in shadow as they face away from the viewer and toward the moonlight. This is in contrast to the three figures at the forefront of the image who face the viewer, are painted in greater details and create shadows. This technique is also used for the cottage whereby the front is bathed in light but the right side is enveloped in darkness. Dune Landscape by Moonlight contains various deep reds, browns, blacks, oranges and yellows. 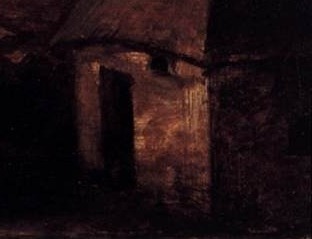 Brouwer uses blacks for the stark shadows of the night as well as to define the more solid objects such as the church steeple, cottage, people and the clouds. He uses reds and bright oranges for the mound of land and upon the thatched roof of the cottage and upon its walls. Yellows are used for the waxing moon, the night sky and the front of the cottage. Yellow is also blended with light and dull browns for the moon's reflection upon the water. 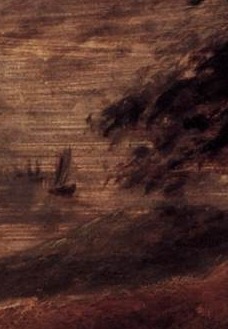 Brouwer's brush strokes are very rough and long and his vivacity in creating this scene is evident on the canvas. He used many lines to recreate the light reaching across the night sky and he uses shorter lines for the ground. The artist blends his warm colors with blacks to create a natural look. For the objects in light he used thicker layers of paint to define movement and accentuate shadows and tones. Despite the crude subject matter of Brouwers' other works his landscapes are somewhat surprising. They have a poetic, almost Romantic quality, quite similar to Rubens but sketchier and more modern depictions as seen in Dune Landscape by Moonlight. Brouwer's maturity as an artist is evident in his landscape works and they express his true feeling of the loveliness of nature around him. His workmanship in these paintings is impeccable. 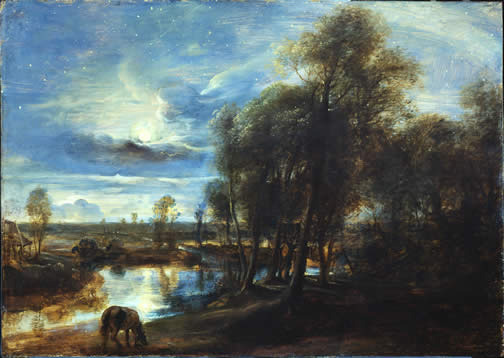 The ultimate 'bohemian artist' of the 17th century, the greatest admiration for Brouwer's work was in regards to his subject matter and landscapes such as Dune Landscape by Moonlight. Most of Brouwer's admirers were close friends too and most sought to recreate the emotional and psychological rendering that he so successfully executed in his works. His landscape works were also recognized for their startling freshness and profound quality and Brouwer's paintings were greatly admired by the great masters Rembrandt and Rubens. Both Rubens and Rembrandt had numerous Brouwer paintings in their own collections and Rubens owned more works by the artist at the time of his death than any other painter. His work was very popular and forgeries even started to be sold in his own time. It was Brouwer's verve and taste in composition that allowed him to stand out from his peers and influence masters such as Adriaen van Ostade, Jan Steen and David Teniers the Younger. Today his works can be found in the best art museums around the world. The success of the Baroque style was promoted by the Roman Catholic Church, which had decided, in response to the Protestant Reformation that art should focus on religious themes and emotional involvement. The aristocracy also saw Baroque art as a means of demonstrating wealth and power. Flemish Baroque painting developed out of the Southern Netherlands between about 1585 and 1700. Flanders' art scene prospered during this time too and many talented artists emerged including Adriaen Brouwer. Flemish Baroque painting saw emphasis shift to still-life, genre paintings of everyday scenes and landscape painting. Adriaen Brouwer was a genre painter who reveled in domestic and street scenes and events taking place in local taverns. 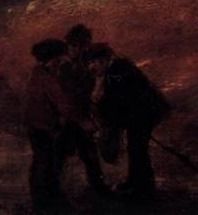 Brouwer is possibly the greatest painter of the lower classes the world has ever known. 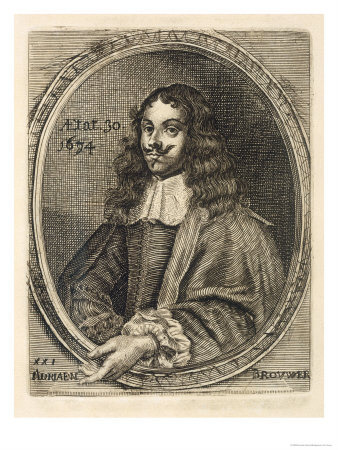 To find out more about Adriaen Brouwer please refer to the recommended reading list below.